Introduction to Mayan animals: sacred, mythical, edible: all pertinent animals of Mayan culture of Guatemala, Mexico, Honduras, etc: birds, felines, other mammals, turtles, snakes, toads, fish, shellfish and insects. The king vulture is one of my favorite birds, due to its colorful head and its rarity: I have never seen one in the wild until this February. One of the park rangers, Teco (Moises Daniel Perez Diaz) has pointed out king vultures circling in the air above the park on several earlier trips (we go to the park once a month, every month). But usually the bird was so high in the sky and so far away that even with an 800mm prime telephoto lens I did not even attempt to capture it. But in late February the bird was a tad less far away, but focusing on a soaring vulture is tough when you are in a lancha which is swinging from side to side from the waves (even calm Lake Yaxha has wind-blown surface movement). Photograph of the zope rey, king vulture, Sarcoramphus papa, soaring over the hills at the far west end of Lake Yaxha, Parque Nacional Yaxha Nakum Naranjo, Peten, Guatemala. Photo by Alejandra Gutierrez, Camera CANON 300 mm, f 2.8, ISO 2,000. So here we show the first attempts to document this rare vulture. If you wish to see this bird, Sarcoramphus papa, connsider visiting Parque Nacional Yaxha Nakum Naranjo, Peten, Guatemala. This park is a great place for birders, especially if you like water birds, especially shore birds. Hotel Ecolodge El Sombrero is available at entrance to the park. To get better photos you need to be on land, not in a boat; need a tripod with gimbal, and a 1000mm lens or a digiscope. We do not yet have a digiscope. If you are able to support advancing our project capabilities at Yaxha (by providing a Nikon, Leica, Zeiss or Swarovski digiscope for our Nikon or Canon cameras, donations are appreciated. Donations to FLAAR are tax deductible for US citizens: frontdesk symbol FLAAR.org is our contact. We assume you can join these words with the appropriate symbol to create an e-mail address. Other equipment we need is any good model Sony mirrorless camera (a7R III or a9) and their special Sony FE 400mm f2.8 GM OSS lens. This would be really appreciated to photograph spider monkeys, howler monkeys, or raptors high in the trees. The Nikon lens, AF-S NIKKOR 500mm f/4E FL ED VR, is another item that could help our entire team of photographers and researchers of plants, mammals, birds, pollinators, and other aspects of Neotropical flora and fauna of the Mayan areas of Central America. 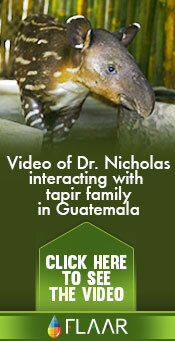 You can also join our team on our next visit to Parque Nacional Yaxha Nakum Naranjo. We go every month, though most of our days are studying insect nests in trees, searching for 3-dimensional lichen, and documenting previously undocumented rain forest ecosystems (every kilometer there is a totally different ecosystem: some are 90% palm trees, some are 90% other trees with almost zero palm trees: we even found a pristine grassland savanna last field trip, the first time an untouched savanna has been photographed and documented for this area of Guatemala. 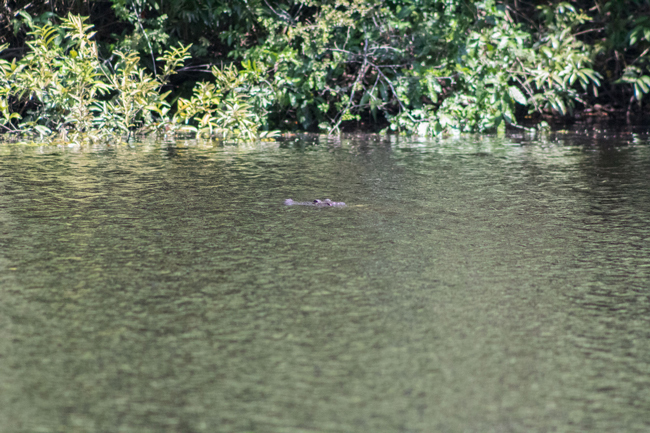 Reportedly there are 80 crocodiles in Laguna Yaxha (not sure whether that includes count for Laguna Sacnab). 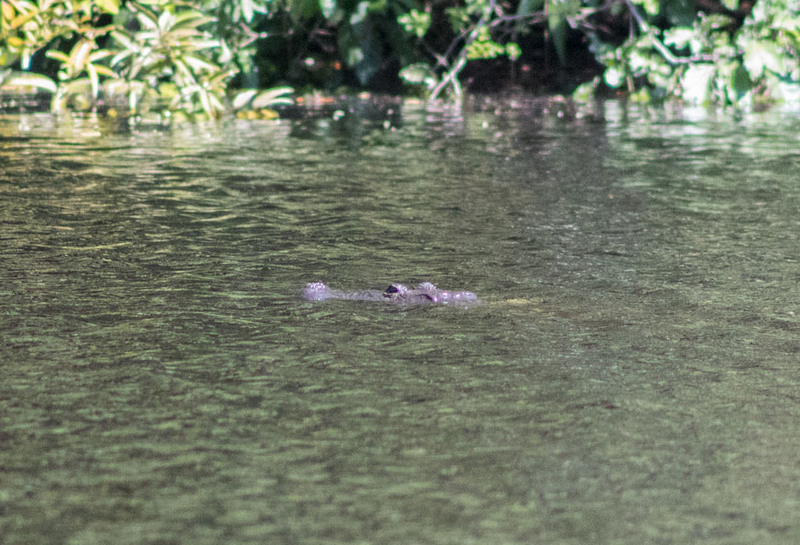 We can now substantiate presence of crocodiles in Rio Holmul, a short walk from the impressive ruins of Nakum. Photo by Nicholas Hellmuth, f5.6, speed 1/2000, ISO 2500 Canon EOS Rebel T6. Lens 75-300mm f/0. To reach the water areas of this river be sure you have a guide; and realize that hungry crocodiles can jump out of the water with lightning speed to grab a meal of fresh meat. As a child growing up in the Missouri Ozarks, me and my brothers and sister had fun finding all the giant engorged ticks on the family dog. We would put the ticks on the floor and stamp down hard with our shoe to see which of us could squirt blood the furthest. 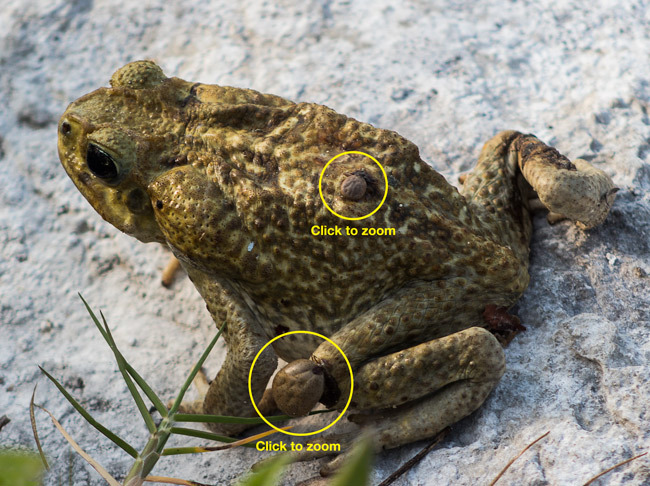 Thus it was great, 70 years later (I am 74 years old now), to find the same large blood-filled ticks, this time on a Bufo species (a toad with venomous sacs). Juan Pablo took these photos since I was in another part of Peten that day. Fortunately no tick has survived on my legs or arms long enough to get very large. But frankly I did not know that ticks would focus on a toad: I thought they would prefer monkeys or jaguars. So today I have learned another fact about biodiversity in the Neotropical seasonally dry rain forests of Guatemala, Central America. There are at least two species of genus Bufo in Peten: Bufo valliceps and Bufo marinus. 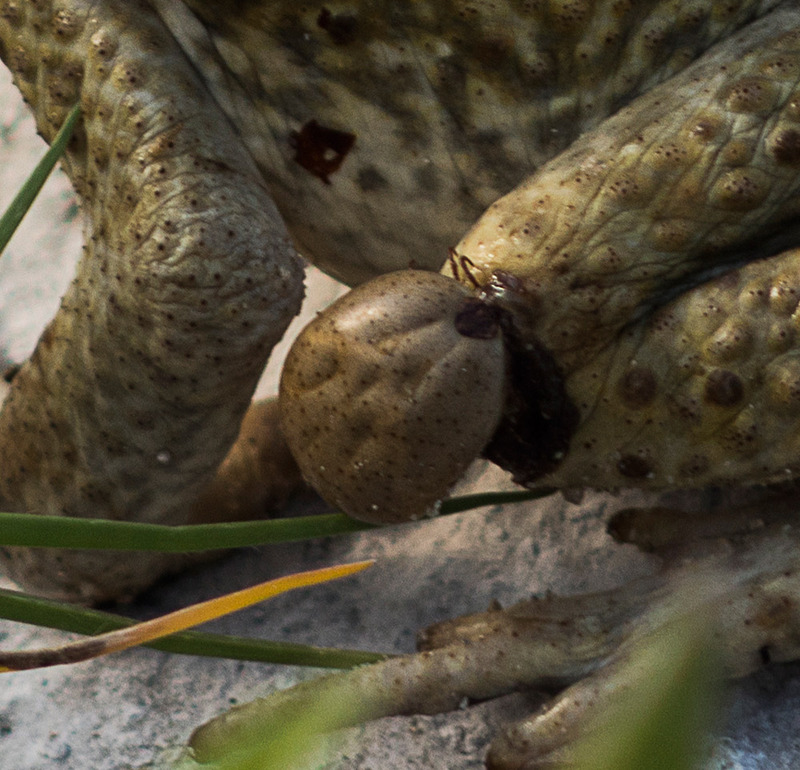 I estimate this is Bufo valliceps. Photo by Nicholas Hellmuth, FLAAR Mesoamerica, 13:40 pm, Canon f9 speed 1250 ISO 2000 lensCanon-EF-300mm-f2. In both cases you often get a “colony”: we have found three to six leaf-pendant arboreal ant nests within a few meters of each other (on different trees). Last week at Parque Nacional Yaxha Nakum Naranjo we found over 40 dark nests on about four different trees which were near each other. These dark nests were often more than 6 per individual tree. I have seen even more along the Rio Polochic, Izabal, Guatemala: dozens or even scores of nests in adjacent trees, high above the ground. We also occasionally find nests of both species within 3 to 4 meters of the ground when the limbs are leaning over the shore of Lake Yaxha. As soon as funding is available we will publish all the high-resolution photos of each and every nest, but now we at least want to get this NEWS item posted. After 3 months of posting close-up photos of the diversity of wasp, bee, and arboreal ant nest structures at Parque Nacional Yaxha Nakum Naranjo, we will now return to waterbirds. Waterbirds are photogenic, and important for Maya archaeologists and epigraphers because waterbirds are often pictured on polychrome plates, vases, and bowls, and as lid-handles on earlier basal flange bowls or tetrapods. Waterbirds are also pictured on Maya carved stone stelae, murals, codices, Mayan hieroglyphs, etc. 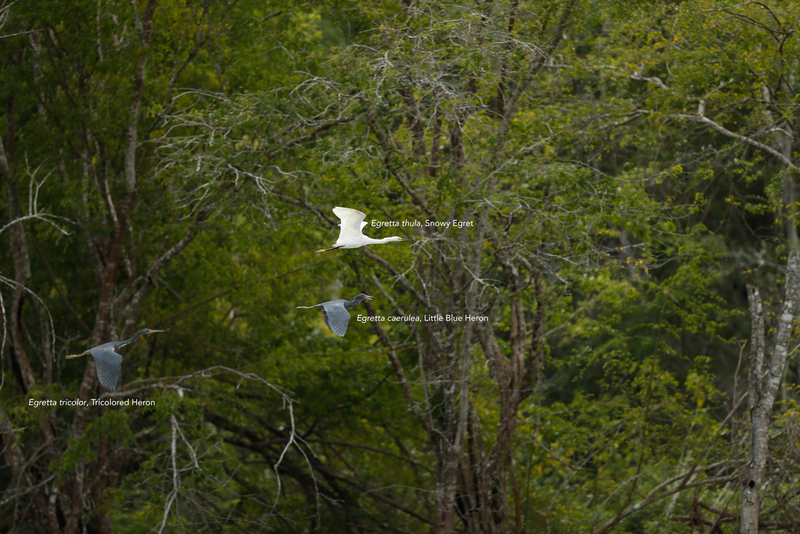 Today we show a unique photograph of three different waterbird species all flying at the same time. Snowy Egret is very easy to find around Lake Yaxha: every month so far: August, September, October, November, December, and January (yes, we have made six field trips here since there are so many birds worth photographing). We are preparing bird lists for the PNYNN and for all the local guides. But every month there are additional birds, so we still have six more monthsto return each month to take notes. Little Blue Heron, Egretta caerulea is present many months of the year, but not as easy to spot. 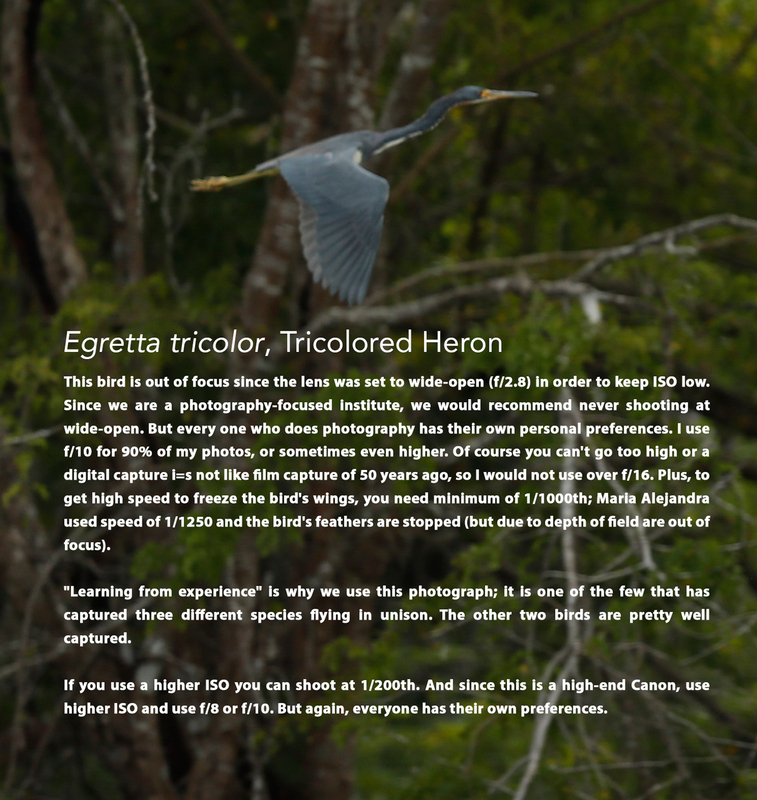 Same for Egretta tricolor, Tricolored Heron: tough to find unless you are patient. To see three Egretta species flying in unison is rare. To capture at least two of the birds nicely focused, and all NICELY ILLUMINATED with natural light is even less seen. Thus our compliments to Mariale Gutierrez (FLAAR Mesoamerica). She captured this remarkable view: Canon EOS-1D X Mark II camera, lens Canon EF300mm f/2.8L IS II USM, settings: Speed 1/1250, ISO 400, f/2.8,; no tripod (photographed from a boat courtesy of PNYNN administration). Come back to visit our www.Maya-ethnozoology.org every week since we will be showing a lot more waterbird and shorebird (wading bird) species. 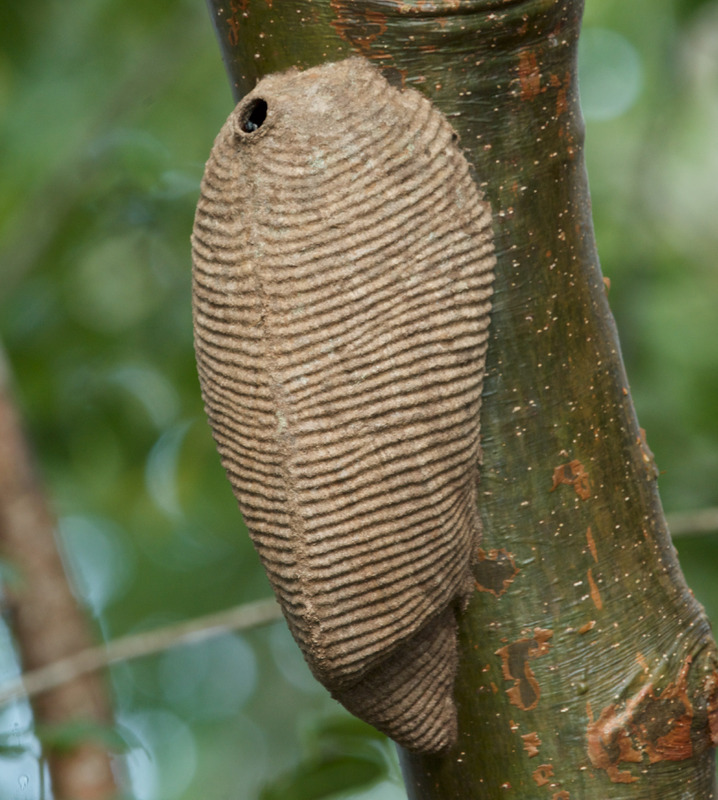 I have been photographing wasp, ant, termite, and bee nests in Guatemala for decades. During recent months we have been focused on finding and photographing all insect nests in Parque Nacional Yaxha Nakum Naranjo, Peten, Guaemala. This is a joint project with the park administrators IDAEH and CONAP. Photo taken by a NIKON D810 Camera, lens Nikon AF-S Micro 60mm F2.8 G; settings: f/13, speed 1/250, ISO 20,000, by Nicholas Hellmuth. 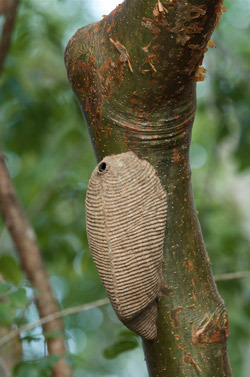 Most of the nests we find are arboreal, including ant nests. But the nest pictured here is above the ground. I estimate that the mass of material in which the nest is located fell from the tree above. This is directly in front of the kitchen of the IDAEH portion of the park camp. It is coincidentally directly underneath an arboreal ant nest which has a tube sticking out for stingless bees that live inside the ant nest (the two insects do not bother each other whatsoever; we have found dual-occupation nests in many places in the park). 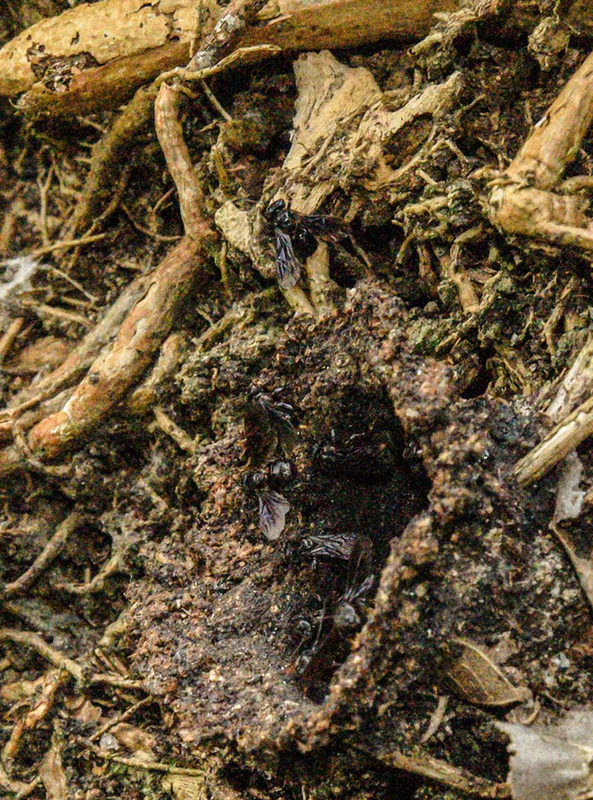 Most of the stingless bee species construct an entrance tunnel of about 1 cm in diameter and between 3 cm up to considerable lengths (sticking out of the tree cavity or sticking out from a crack in the ground). What was different about this entrance was its irregular shape and its wide diameter (estimated 4 to 5 cm; we did not want to disturb the busy bees by trying to measure it with a ruler). We estimate these are Trigona nigerrima; their local name is Cushusho. The bees only attacked when they saw me in front of the nest (taking photos). When I photographed from behind a tree and photographing the side, they did not notice me. But the best photos would be with a macro lens and from the front! However they attack en masse, and burrow into your hair, down the neck and sleeves of your shirt, etc. Parque Nacional Yaxha Nakum Naranjo, Peten, Guaemala is a great place to do research on bees, wasps, ants, termites, and thousands of other insects. We will be back at the park in a week, looking for more insect nests, waterbirds, aquatic orchids, palm trees, and interesting eco-systems to photograph. You can see more photos on our www.Maya-ethnobotany.org and www.digital-photography.org. Since we come to Parque Nacional Yaxha Nakum Naranjo to learn about insects, waterbirds, mammals, lichens, moss, mushrooms, and all the palm trees, I recommend staying at hotel Ecolodge El Sombrero (turn to left just before the entrance to the park). 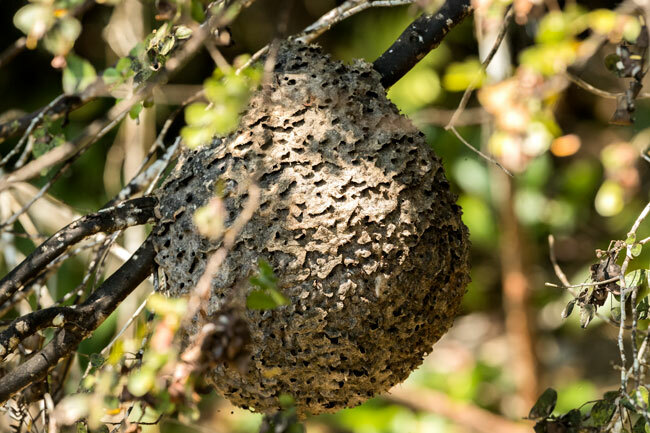 Here are photos of one of my favorite sizes and shapes of wasp nest. Since I studied architectural sciences as an undergraduate student, and as most of the Hellmuth family are architects, I like architecture and engineering of wasp nests, bee hives, ant nests, and termite nests (and of course nests of orioles and oropendolas). While photographing the bright red fruit of a palm tree and a red inflorescence of a large arboreal bromeliad (in front of the dining room of the restaurant), one of the team pointed out a wasp nest on a far away tree. 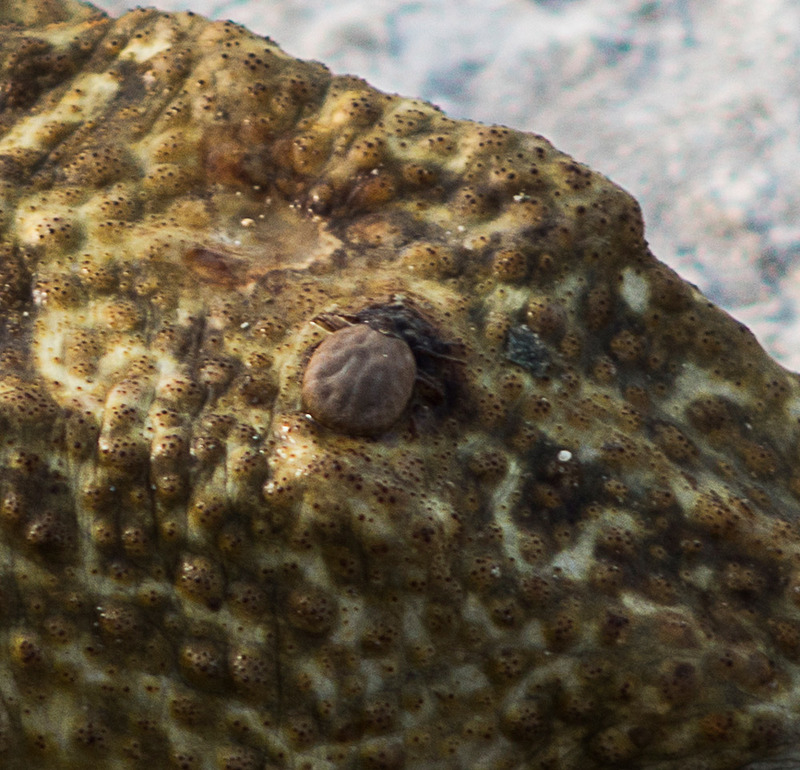 So with a prime telephoto lens (which is sharper than a zoom lens), I took photos. Fortunately the sun was at a perfect angle. Lots to see in this remarkable national park: Yaxha Nakum Naranjo (and of course Topoxte Island). Our www.maya-ethnobotany.org web site shows you the gorgeous tropical flowers of this park. Our www.digital-photography.org web site. Visit www.maya-archaeology.org to see edible plants and other aspects of the flora and fauna which the Classic Maya had available over a thousand years ago. I climbed to the second floor balcony so I could better record the circular entrance to this nest. Lighting is natural sunlight at 9:51 in the morning.